We find out early in life that it isn’t permissible to be barefaced and tell the truth in the every day. Instead, as little girls we dress up the spine of our stories, hiding the scars or perfecting them in order to say what is acceptable, “I’m fine, how are you?” But we aren’t supposed to say anything else, especially about our scars, wounds, and how we are really feeling. I’ve also learned there is no such thing as coincidence. I believe everything, absolutely everything happens for a reason in order to teach us life lessons or reveal something deep in our fragile human condition. I believe this partly because I was born with an extra dose of sensitivity and found out as a mere child, life did not work for me. It or I was broken. I could not fit in. Coincidence nudged me to find God as I grew up. Feeling like I didn’t fit in felt like the Grand Canyon had been carved from my heart. Other girls were pretty, collected, witty, non-messy, grew up in nonalcoholic homes, not frizzy, and had IT which left me searching for my own it. But I digress….I believe God knows our faith is weak which is why he created coincidence. He knows that even though we should have faith by focusing on the work of his unseen, he uses the physical to help us in our blindness which where coincidence comes in. Yesterday at work, I had three very different people tell me I was pretty. I have a hard time believing that I am pretty as woman or human being. Mainly because I know how deeply flawed I am as I struggle to keep the door to my closet stuffed full of secrets, CLOSED. Sealed tight. Occasionally, it rumbles and spills out on anyone within my texting messaging circle or people I live with. Sorry Runner Friend, Birthday Mother, and Family. I also know I’d much rather bunker down behind my addictions to stuff my feelings of inadequacies rather than attempt the awkwardness of casual conversations bared faced and clean. 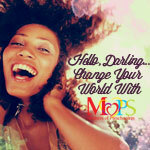 Most often my flaws are ugly brutal when they spill over into motherhood or marriage. And friends? I struggle between trying to be myself (ugh…who am I again?) and stuffing the anxiety that rises within me to make her like me. And if I’m honest I’m still hiding from Runner Friend, Birthday Mother, and Family because of what my kids and husband affectionately call the Raspberry Sherbet Moment. and wait for the Lord. Psalm 27:13-14. Here’s the thing, the scars we carry, they are God’s Glory. The moments of our desperation and despair, they are his jewels. They mark us as real people, with real lives, with real problems. They become the bridge to freedom. It reveals just how human we are and how a piece of Jesus is in every heart. Jesus didn’t become precious because of his perfect life—he became precious because of his scars. Nailed, whipped, battered, stabbed, a son of a teenage mom, not accepted by his family, beaten and crowned with the thorns of our lives, he became God’s reckoning so we could become pretty. His scars? His disciples recognized him AFTER he revealed the scars of his side, hands and feet. Jesus revealed His wounds so we could fully live. Those people who told me I was pretty? They were God in the flesh whispering His affections and affirmations of who I am to Him, to combat how my little brain processes and sees myself. 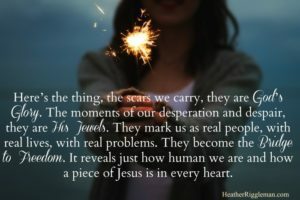 Those people, they saw my scars, my real-ness, my mess, His Glory clothed in my skin and said the words God already knew to be true. Don’t cover your scars with “I’m fine, how are you,” be real, be Jesus. Be the bridge to Freedom for others. 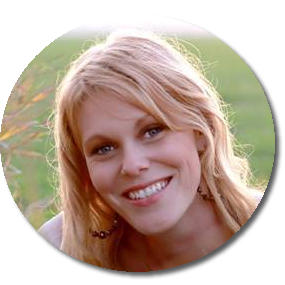 For more of Heather’s great perspective on life and motherhood, check out Heather’s book Mama Needs A Time-Out: Daily Getaways for the Mom’s Soul.